Functionality, Flexibility, and Responsiveness are the three resounding measures users will find in the Amplica website theme. 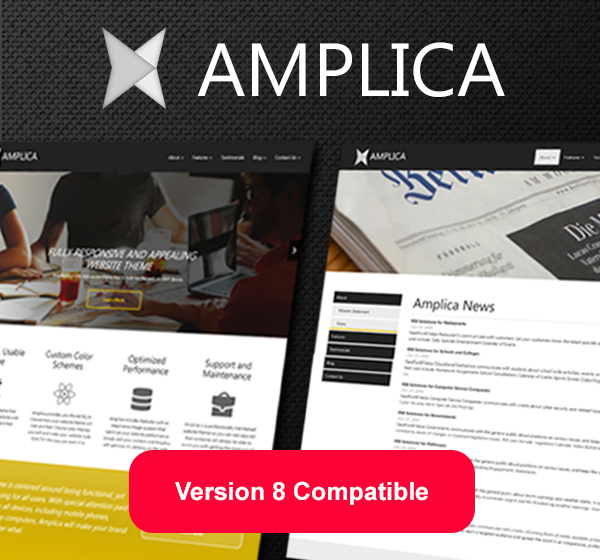 Developed by Trinamic Digital Solutions, Amplica is a theme that provides individuals or companies from any background a tool to make a professional statement on the web. Furthermore, our small team at Trinamic is more than willing to support you with any questions or issues you encounter in personalizing your own site. We are all about creating a simple, enjoyable user-experience and take pride in supporting individuals and companies make a strong impression! Feel free to reach out to us with any questions prior to purchase if necessary!